The goal of this bi-weekly newsletter is to provide our followers with some of the most important fundamental and technical trends in commodity markets this week. Weekly Department of Energy release shows surprising increase in crude oil inventories. 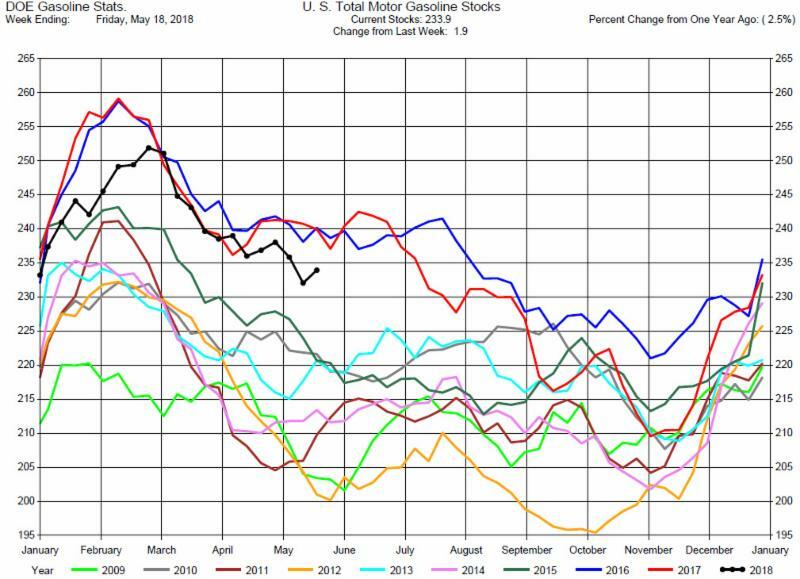 The weekly Department of Energy release for the week ending May 18 reported Total Crude Oil Inventories increased by 5.8 million barrels to 438.1 million barrels. At the same time, Total MotorGasoline inventories increased by 1.9 million barrels to 233.9 million barrels. For Fundamental Analytics analysis of the DOE, release, click on this link. 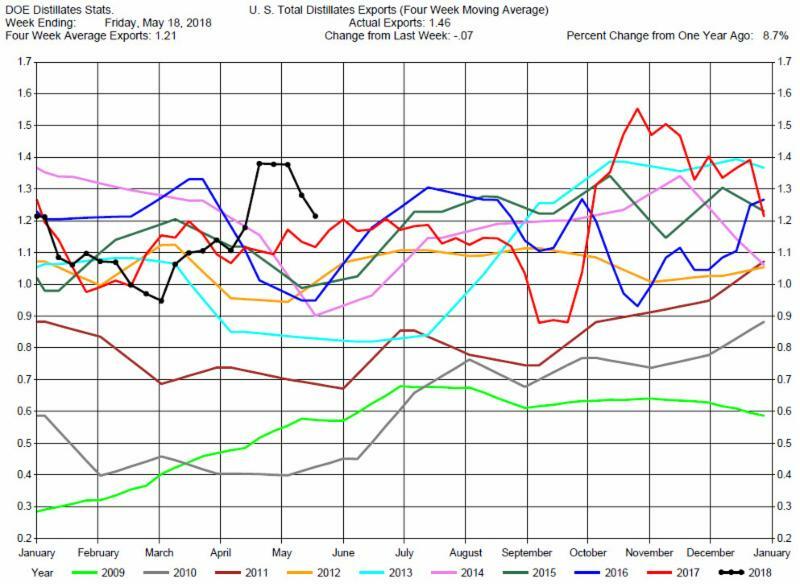 The Foreign Agricultural Service (FAS) export sales report shows accumulated exports of corn and soybean are in line with expectations. 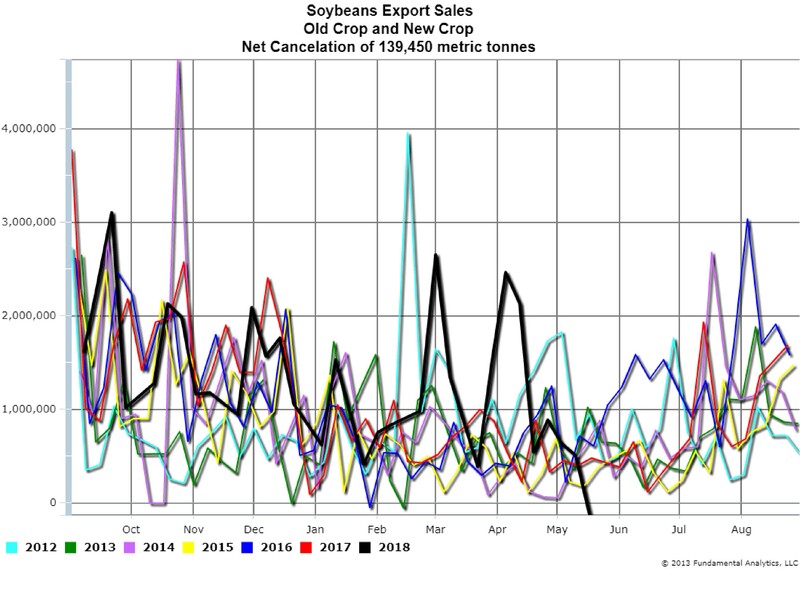 However, likely due to the US-China trade dispute over agricultural tariffs, export sales for soybeans were not cancellations. See the charts below for more information. 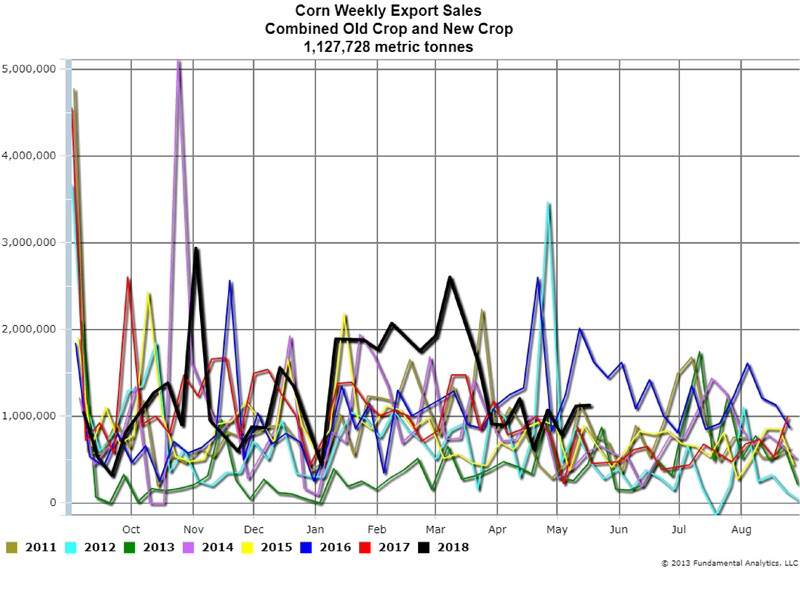 Combined Old Crop and New Crop Corn sales totaled 1,127,728 metric tonnes (black line denotes 2017/2018 market year). 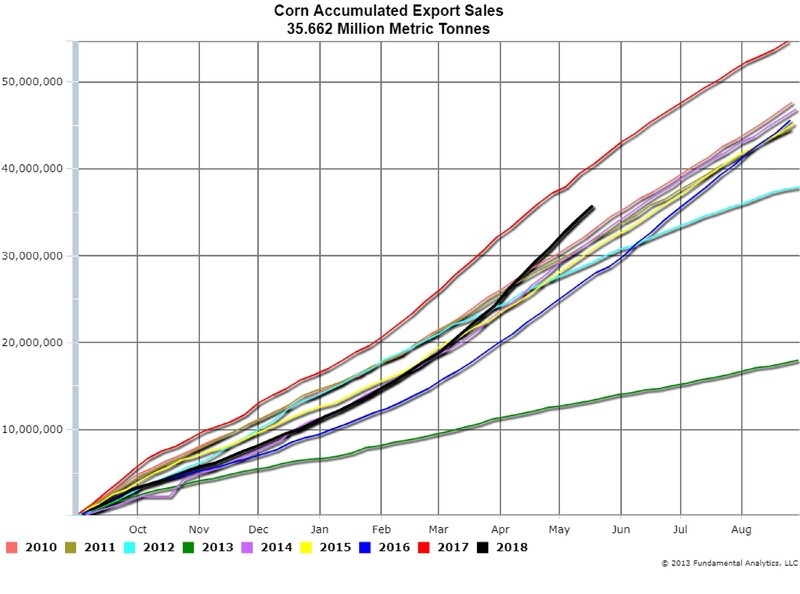 Corn Accumulated Export sales at 35.662 million metric tonnes, now at 95% of USDA goal for the 2017/2018 marketing year. There is potential for this market year to reach the record levels of 2017 (the black line denotes the 2017/2018 market year). Combined Old Crop and New Crop Soybeans sales were a net cancellation of 139,450 metric tonnes. This created a record low where the net exports was a negative of 132,561 metric tonnes. The net exports negative was potentially in response to the US-China trade dispute over agricultural tariffs (the black line denotes the 2017/2018 market year). Soybean accumulated Exports Sales were reported at 45.440 million metric tonnes, now at 98% of USDA goal for the 2017/2018 marketing year. Subscribe to our newsletter for more insights and analysis, or contact us to find out about or free trial offer!